Chairman Tony Stewart has no doubt that new manager Alan Stubbs can lead Rotherham United to a higher Championship finish than last year. The Millers are third from bottom after their first five matches brought a home win and draw and three away defeats. But Stewart believes the club will start moving up the table under Stubbs as the summer recruits settle in. “We’re a young side. We’ve brought in 13 players,” he said. “They got to come together and work together and get to know each other,” he said. Rotherham finished in 21st place last term, avoiding relegation with something to spare thanks to a late-season 11-match unbeaten run under Neil Warnock. This time last year, Rotherham - back in action on Saturday at home to Bristol City after the international break - had only one point from their opening five fixtures. “Alan and his team are competent,” Stewart added. “Alan is not a person for many words, but when he does say words they makes sense. He’s a very sensible guy. Stubbs had talked about pushing for the top 10 when he was appointed in June. 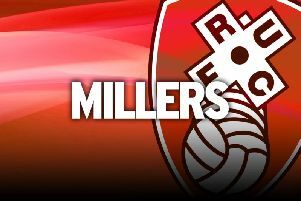 The Millers, who signed free-agent striker Dexter Blackstock earlier this week and are looking to bring in another frontman, were beaten 4-0 in their last outing, at Barnsley, and Stewart knows there’s only one way to placate supporters. Blackstock has revealed how Stubbs impressed him when they talked prior to the centre-forward’s move to New York Stadium on a three-year deal.